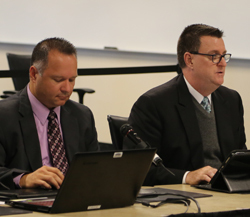 Judge Brian L. McCabe (right), co-chair of the council's 2% Funding Request Review Subcommittee, and Zlatko Theodorovic, director of Judicial Council Finance, present the Mono Superior Court's request for supplemental funding. SACRAMENTO— At its public meeting on October 27 in Sacramento, the Judicial Council approved a request for $49,000 in supplemental funding for the Superior Court of Mono County. The council is required by statute to set aside 2% ($37.7 million this fiscal year) of the total funds appropriated annually in the Trial Court Trust Fund for urgent needs of the trial courts. The funds will help the undersized, 11-person-staffed Mono court manage a lump-sum payout to a retiring employee that it can’t address with its own limited reserve funds. Trial courts by statute can keep no more than 1% of their operating budgets in reserve per fiscal year. Without the additional funding, the court would have been forced to institute four furlough days and court closures to offset the cost. Though the funding request was small, council members grappled with the issues of precedence and fairness to other courts. Unused reserve funds in the Trial Court Trust Fund are redistributed proportionately back to all trial courts each year. But council members also recognized the particular challenges facing a small court. The council ultimately approved the Mono court’s funding request by a 17-2 vote. NOTE: A request for supplemental funding by the Superior Court of Tehama County was deferred to the council’s December 10-11 meeting. Appearance in Court for Infractions Without Deposit of Bail: The council approved recommendations to amend rule 4.105 of the California Rules of Court, which directs courts to allow people who have traffic tickets to appear for arraignment and trial without deposit of bail, unless certain specified exceptions apply. The amendments apply the rule to non-traffic infractions and require courts to consider the totality of the circumstances, including whether the bail amount would impose undue hardship, when setting bail amounts before trial. Court Appointed Special Advocate (CASA) Local Assistance Funding: The council approved CASA program grant funding for fiscal year 2015-2016. The allocations will fund 45 CASA programs serving 50 counties. Court Appointed Special Advocates are volunteers who advocate for the best interests of abused and neglected children in courtrooms and communities. Volunteer advocates—empowered directly by the courts—offer judges the critical information they need to ensure that each child’s rights and needs are being attended to while in foster care. Adoption and Permanency Month Resolution: The council adopted a resolution proclaiming November as Court Adoption and Permanency Month. See this news release for more details. An archived audiocast of the entire meeting broken out by topic will be available on the council meeting information webpage later this week.